Well. Interesting question - my experience amongst my acquaintance is that you are right and Mat is wrong. And my favourite pickle is Lime pickle! Whereas although I ate liquorice when young, I didn't enjoy it that much and frankly wouldn't care if it disappeared from the universe. And don't even get me started on mixed pickled - powerful, punchy lime, straight up strange piccalilli (try explaining that to your American relatives). And then there's chutneys (for what are they but sweet spicy pickles really). Liquorish? Meh. Can take it or leave it. I LOVE pickles. In fact, the only pickled thing I probably don't love is pickled egg. When I was a kid, my parents used to buy pickled onions only at Christmas. I was so overcome with pickled onion lust that I would sneak into the kitchen, sit on the floor and eat them straight from the jar. I love them in a turkey sandwich. Ooh, and pickled gherkins in a ham sandwich, bit of mustard. Cor. Liquorice I can eat, but I don't like it very much at all. @chumbles - Nice lime pickle with some poppadums goes down a treat. We all know Mat is wrong - just need to get him to admit it. I know, it makes no sense at all to reject such bounty. @suzler - You're right, pickled eggs are grim. Terry gave me a bit of one in the pub after service and it made me wince. But the rest of it is pickle beauty. Liquorice is horrible stuff, I have never liked it, pickles on the other hand are wonderful (except lime pickle). I remember when I was young helping my mum make pickled onions & piccalilli, the house would stink for weeks but it wa worth it! Clearly you are right (and normal) and Mat is wrong. Not liking Pickles? What is the world coming to? Pickles clearly rock, as I showed in my review of the actual onions in the vid. And last night at an event I very much enjoyed a canape involving cornichons. Licorice on the other hand, is the food of the devil. 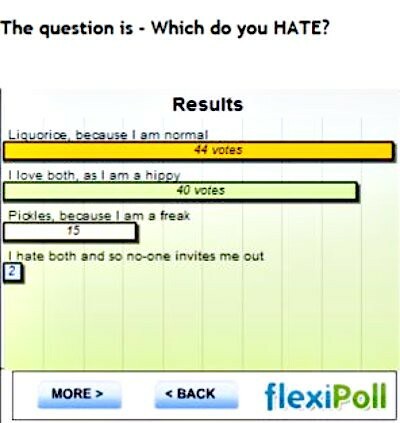 I like both, but definitely lean towards pickles. I don't think a day goes by when I am cooking and sneak a few pickled onions, a gherkin or a spoon full of lime pickle. I would much rather eat pickles and liquorice. What happens if you pickle liquorice?! @Miss Whiplash - Exactly, my dear. Exactly. @Nick Baines - Lean further, my good man. @Sarah, Maison Cupcake - The world may implode. But - go on, have a go! It is most edifying to discover that I am of the most normal persuasion...liquorice is not something you can eat everyday is it? Not like your pickles.Especially Italian Giardinera pickles. Yumyum. I love all pickles and all liquorice (except those vile Allsorts) so which is best? I almost divorced my husband when he ate a liquorice ice cream on our honeymoon...why would you spoil wonderful Italian icecream with that?!!! Liquorice is not right. It's just not. I hate it. BUT oddly I USED to like it (and those aniseed gobstoppers, remember those) when I was a kid. Then, when I was still virtually a kid (17 or so) I got SOOOOOO very drunk on Greek ouzo that even to this day, more than 2 years later, aniseed is anathema to me. Pickles, of course, as you know, I loves. @Josordoni - I'm not sure I've ever had Giadinera pickles! @luciebythesea - You made me snort with laughter! Free dinner for you or for me??? Obviously pickles are delicious and liquorice is disgusting. I always get extra gherkins in burgers and they are the secret ingredient in my bacon sandwich extraordinaire. As a child I used to eat anything pickled by the jarload. All chutneys and pickles are heaven in a jar too. Liquorice on the other hand is yucky and evil. In sum, I love pickles. @Becci - Apologies, I have clarified. The free dinner is for me on Mat when he ultimately loses. All you guys get is the pleasure of backing the right horse (unless you like licorice, that is). In sum, you are correct in your love for pickles. ps Have you written about your bacon sandwich extraordinaire? Link? Obviously,you may remember Im a convert.Particularly like the Barry shallots.